Homemade buttercream may sound simple enough to make, but getting the right consistency every time can be a real challenge, especially in the hot summer months. Why not save your time and energy? 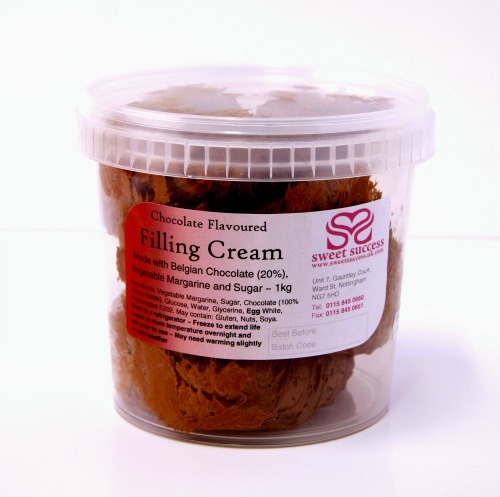 We now offer a ready to use filling cream, ideal for filling and masking sponge celebration cakes. Deliciously smooth, it doesn't have the 'gritty' sugary texture of homemade buttercream. Our filling cream is a smooth blend of vegetable margarine and sugar, which can be coloured and flavoured however you like, or simply used straight from the pack. As it is much whiter than most homemade types, you will find it takes colour more easily, and it can be piped into swirls to decorate cupcakes too. By popular demand, we now also make a ready to use rich chocolate filling cream, flavoured with real 100% unsweetened Belgian Chocolate. A 1kg pack of vanilla or chocolate filling cream should easily fill and cover 1 x 12" or 2 x 8" cakes - depending how thickly you apply it, you may have some left over. Be careful not to fill your cake too enthusiastically though, else it may start to bulge! Apply a thin layer to the outside of the cake before covering with roll-out sugarpaste - this will secure the sugarpaste to your cake base. Before using the filling cream, make sure it is at a soft spreadable consistency - depending on the time of year, you may need to leave it out of the fridge for a few hours or overnight prior to use. If the filling is too cold and firm, place in a bowl over warm water and stir to soften, or try using a microwave to warm it in short bursts. You will find our chocolate filling cream is always naturally firmer due to the high percentage of actual chocolate used, so you will need to warm it slightly to bring it to the right consistency for spreading or piping. If you find your filling cream becomes too soft to work with in warm weather, or if you have overwarmed it slightly, just let it rest in the fridge for a short time and then rebeat with a wooden spatula or electric mixer to regain the light fluffy consistency. Sweet Success filling cream should keep well in the fridge for at least 10 weeks, and can be frozen for up to 9 months. Filling Cream Ingredients: Vegetable Margarine, Sugar, Glucose Syrup, Water, Glycerine, Dried Egg White, Preservative E202, Vanilla Flavour. Please Note: CONTAINS EGG WHITE. Our Chocolate filling cream also contains 20% Belgian Chocolate (100% Cocoa Solids).